In this era of digital disruption, organizations like yours are staying competitive by adopting new ways to manage their most important resource: their people. Please join us along with two guest speakers, for a live webcast and hear about new digital tools and strategies that are helping organizations of all sizes work smarter. Attend this webcast to learn how top agencies achieve organic growth rates two to four times the average using a strategic approach to recruiting and developing top producer talent and supporting them with smart tech to compete and accelerate their sales velocity. Customer expectations are evolving as quickly as the digital technology they use every day. For example, most people expect to provide and receive information on their mobile device, they want to comparison shop before they buy and they expect a 24/7 connection with their agency. Do you know where to start so you don't get lost along the way? Staying competitive in this rapidly changing era requires a focus on the customer experience like never before. In this webinar, you’ll learn about the tools you need to help your agency adapt to the times. Did you know that millennials now outnumber baby boomers as America's largest generation? There's good news for the insurance industry: compared to previous generations at their age, millennials are more loyal to their employers. Whether you are part of the millennial generation, or you’re just trying to figure out how to tap that hireable market, you won’t want to miss this webinar! Join Vertafore and the NetVU Young Professionals Chapter to hear from a panel of successful young insurance professionals as they talk about working in the industry and what agencies need to do to attract the next generation workforce. Join Vertafore for an executive webcast to learn why independent agents need to start shifting from a demand response to a demand creation mindset. Learn a proven strategy for agency growth, see a live demo of the new Vertafore Agency SalesTrack and listen to a principal explain how SalesTrack will take his agency to the next level of growth. SalesTrack is an innovative new solution that allows agencies to quickly pull up detailed data on producer performance, sales pipeline and lead sources. Vertafore offers the broadest and most adaptable technology solutions to better prepare the insurance industry for digital disruption. The Vertafore product line is built on a platform, empowering customers and other solution providers to adapt and thrive as the market changes. Vertafore’s platform features fast innovation, partnerships with the best technology companies, and customizable solutions to help companies remain independent during a time of industry disruption. 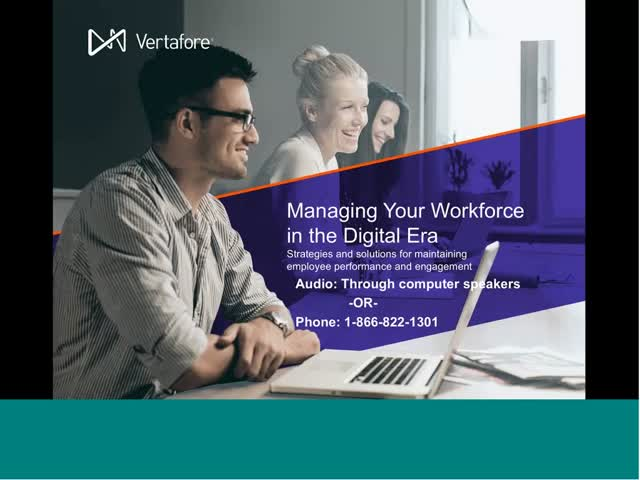 As the leader in modern insurance technology with the largest customer base in the industry, Vertafore connects every point of the distribution channel, from agencies and carriers to MGAs, MGUs, and state governments.